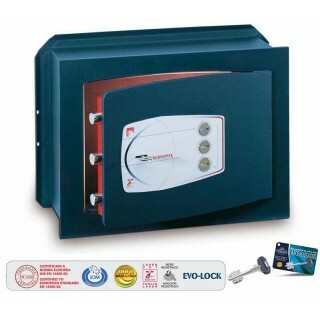 Wall safe Technomax Gold Key GD/7 series with double bit key and combination block with 3 recessed handwheels. 1 internal shef. Wall safe with double-bit key and combination block with 3 recessed handwheels of 20 positions each. Nickel-plated steel, lock mechanism protected by a steel plate, it is equipped with special walls to hold out longer attempts to break-ins with bat, it is powder-coated thermo-hardening. Front thickness is 10 mm, with laser cutting. For more information see the Technomax official page.